NGINX leads the pack in web performance, and it’s all due to the way the software is designed. 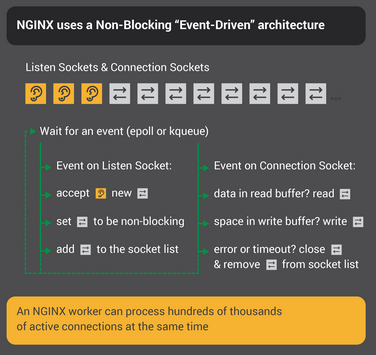 Whereas many web servers and application servers use a simple threaded or process‑based architecture, NGINX stands out with a sophisticated event‑driven architecture that enables it to scale to hundreds of thousands of concurrent connections on modern hardware. 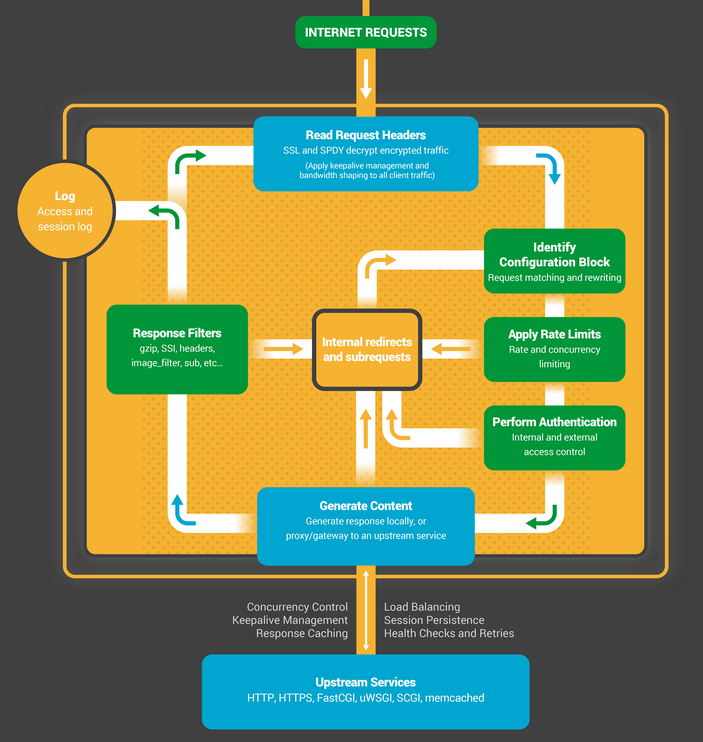 The Inside NGINX infographic drills down from the high‑level process architecture to illustrate how NGINX handles multiple connections within a single process. This blog explains how it all works in further detail. 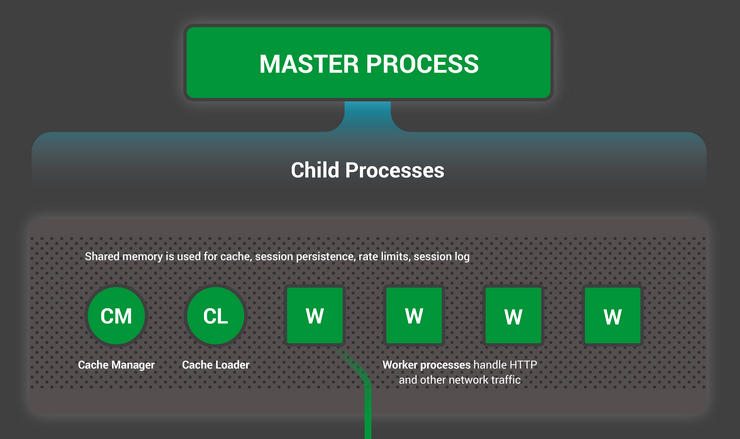 On this four‑core server, the NGINX master process creates four worker processes and a couple of cache helper processes which manage the on‑disk content cache. The cache loader process runs at startup to load the disk‑based cache into memory, and then exits. It is scheduled conservatively, so its resource demands are low. 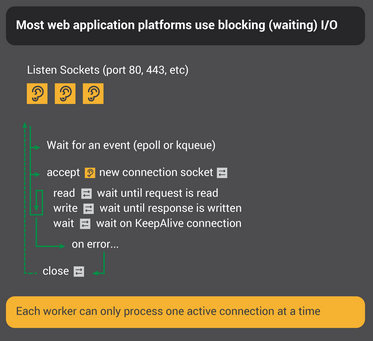 When an NGINX server is active, only the worker processes are busy. Each worker process handles multiple connections in a nonblocking fashion, reducing the number of context switches. Each worker process is single‑threaded and runs independently, grabbing new connections and processing them. The processes can communicate using shared memory for shared cache data, session persistence data, and other shared resources. However, the rules of the game can be very complicated. For example, the web server might need to communicate with other parties (proxying to an upstream application) or talk to an authentication server. Third‑party modules in the web server can even extend the rules of the game. Recall our description of a process or thread as a self‑contained set of instructions that the operating system can schedule to run on a CPU core. Most web servers and web applications use a process‑per‑connection or thread‑per‑connection model to play the chess game. Each process or thread contains the instructions to play one game through to the end. During the time the process is run by the server, it spends most of its time ‘blocked’ – waiting for the client to complete its next move. The important point to remember is that every active HTTP connection (every chess game) requires a dedicated process or thread (a grandmaster). This architecture is simple and easy to extend with third‑party modules (‘new rules’). However, there’s a huge imbalance: the rather lightweight HTTP connection, represented by a file descriptor and a small amount of memory, maps to a separate thread or process, a very heavyweight operating system object. It’s a programming convenience, but it’s massively wasteful. Why Is This Faster than a Blocking, Multiprocess Architecture? In the blocking, connection‑per‑process approach, each connection requires a large amount of additional resources and overhead, and context switches (swapping from one process to another) are very frequent. For a more detailed explanation, check out this article about NGINX architecture, by Andrew Alexeev, VP of Corporate Development and Co‑Founder at NGINX, Inc.
Updating NGINX configuration is a very simple, lightweight, and reliable operation. It typically just means running the nginx -s reload command, which checks the configuration on disk and sends the master process a SIGHUP signal. 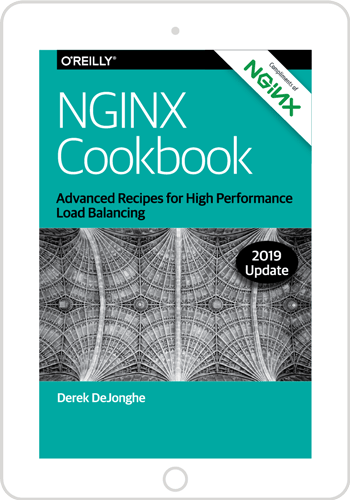 NGINX’s binary upgrade process achieves the Holy Grail of high availability – you can upgrade the software on the fly, without any dropped connections, downtime, or interruption in service. The Inside NGINX infographic provides a high‑level overview of how NGINX functions, but behind this simple explanation is over ten years of innovation and optimization that enable NGINX to deliver the best possible performance on a wide range of hardware while maintaining the security and reliability that modern web applications require.